In September 1649, while exiled in France, King Charles II of England tried to rally his nobles by granting 5.28 million acres "lying in America" to seven of the men, according to the deed. The only condition was that Charles regain his kingdom. The deed's boundaries were as vague as the era's maps: "bounded by and within the head of Tappahannocke als [alias] Rappahanocke and Quircough or Patawomecke Rivers, the Courses of said Rivers and Chesapayoake Bay." At the time, the seven noblemen were selling their jewels and riches to buy food and shelter, so a cottage in Surrey might have been a more practical gift. But about 70 years later, that grant – validated by Charles's restoration to the British throne in 1660 – had become quite valuable. And troublesome. As American settlement increased, an upper-class struggle arose as to where the line between the head springs of the Potomac and Rappahannock rivers lay, a boundary that would become known as the Fairfax Line. North of this line, anyone leasing or purchasing land was to acquire it from Thomas, the sixth Baron of Fairfax, who had become sole proprietor of the royal grant through deed transfers, intrigue and marriage. South of the line, land was leased or purchased through the governor of Virginia by authority vested in him by the king of Great Britain. Governor and lord contested boundary lines, battling over nearly a million acres of land containing prime soils in the Virginia Piedmont and lower Shenandoah Valley. These disputed lands included all of today's Culpeper, Madison and Rappahannock counties and, in the valley, Shenandoah County and most of Page and Warren counties. The Virginia colony claimed that the Fairfax Line began at the head spring of the Rappahannock River, in the extreme southwest of today's Fauquier County. Lord Fairfax argued that the line began 33 miles to the south, at the head spring of the middle fork of the Conway River, the major continuance of the Rapidan River. By the late 1720s, land agents for the governor of Virginia were issuing massive grants in lands that Fairfax claimed, and in 1733 the British Privy Council decided to hear Fairfax's protests of these intrusions. Testimony of backwoods trappers, surveyors, mapmakers and the Virginia nobility was inconclusive. But whenever someone cited what the Indians thought was the stream with the greatest flow, the Rapidan came out the winner. Virginia v. Fairfax was decided in April 1745, and Lord Fairfax received his due. The Rapidan was not only the larger tributary but was in more of a direct line with the lower course of the Rappahannock — the course known to have existed in 1649. In September 1746, the last of the grand exploratory and survey parties to traverse the mountainous wilds of the commonwealth met near Orange Court House. About 40 men and packhorses then trekked to the head spring of the Conway and from the spring northwestward to mark the Fairfax Line. The group included surveyor and mapmaker Peter Jefferson, the father of Thomas Jefferson, and surveyor and mathematician Joshua Fry. Together they would produce two editions of a detailed map of Virginia in the 1750s. Fry and Jefferson represented the interests of the governor — as he feared that Lord Fairfax's surveyors, Thomas Lewis and Robert Brooke III*, might try to gain additional acreage. Such lands might have been considerable, given the line's length of 76.5 miles between the Conway's middle fork head spring and the North Branch of the Potomac River's head spring. Lewis, a quill pen and ink in his baggage and a small notebook in his pocket, described the 59-day journey in his journal. It took the party 35 days to reach the Potomac's head spring, its location ascertained by a decade-old survey. Upon reaching the spot on Oct. 22, the party "Dined on Loyn Roasted Venison" and "Drank his Majestys health," Lewis wrote. The next day they carved their names and the year 1746 on several nearby trees and chiseled the initials "FX" on a stone, which marked the Fairfax Line's western end and the southwest corner of Maryland. That stone is not the boulder with the plaque on it today. The original stone, its "FX" barely visible when observed in 1858, was destroyed by vandals about 1883. Another stone replaced it, but lest it suffer the same fate as the original, its location is known by few. On the 76-mile, 24-day trip back home, the party missed its original starting point by only 100 yards -- a level of accuracy befitting its principals. Again there was the carving of names, initials and dates on trees, and the chiseling of "FX" on a second stone, this one marking the east end of the Fairfax Line. A debate now exists as to whether the second "FX Stone" has been found. This land, in Greene County, is part of Shenandoah National Park. In 1989 and '90, park staffers -- "on their personal time," their report said -- undertook a concerted but futile effort to find the stone. The next major effort came in September 1999. 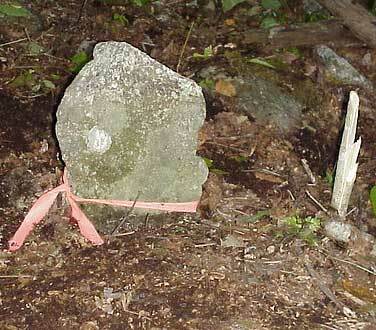 That year's members' "rendezvous" of the Surveyors Historical Society featured a hunt for the stone. Its location had long been a challenge to society board member David Ingram, who, when I spoke to him recently, described himself as "a little country surveyor from Mount Crawford, Virginia." The Fairfax Line marks the northeastern boundary of his home county, Rockingham. In preparation for the event, Ingram and others spent about a year locating still-existing monuments along the Fairfax Line. These monuments were then pinpointed on the Earth's surface with the aid of a Global Positioning System instrument. The rendezvous itself attracted more than 100 society members, some in Colonial garb. The group spent several hours climbing up a mountain from the Conway River. They then began hunting for the stone, its location more or less ascertained by the previous GPS measurements. "Boulders were everywhere you looked," Mary Root, a surveyor from Remington, told me a few weeks ago. "We brushed off rock after rock and marked each one with a keel -- red and yellow. We must have looked at thousands of granite rocks. People began to say of the lines on the rocks, 'Well, it looks a little like an F.' "
Rick Casteel, a West Virginia surveyor, found a two-foot vertical fieldstone sticking out of the ground. Charles Langelan, who chronicled the search in the Surveyors Historical Society journal Backsights (edited by Root), wrote of the stone's striations: "If you imagined hard enough, might have had a faint 'F', but no 'X'." Ingram said he thinks the stone Casteel found is the Fairfax Stone. "It's in the correct location and appears to be a set stone," he said. Mary Root and her husband, Ray, also a surveyor, are not so sure. "It's the right size for a modern surveying stone," Ray Root told me, "but a few years ago I saw several marked stones on the Mason and Dixon line [completed in 1767], and they were very prominent." He added, "Maybe part of the stone [Casteel found] had broken off. It was in the right place at the right time." For further reading: Thomas Lewis's 1746 journal has been published, with added commentary and maps, by the Shenandoah County Historical Society, Edinburg, Va.
* Robert Brooke III, was the son of Robert Brooke II, the Knight of the Golden Horseshoe. Robert Brooke II was with the survey party of 1736 that mapped the headwaters of the Potomac. In 1746, Robert III was in the survey party with Jefferson and Lewis to map the Fairfax Line to the point his father mapped 10 years earlier.